Dr. Leone, It was good to see you again yesterday and I want to thank you once again for correcting my hip problem via total hip replacement surgery. 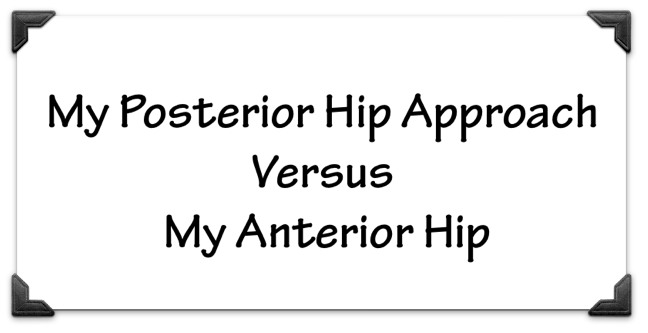 Pursuant to our conversation I would like to give you some examples from my experience as to why I believe your procedure is far superior to the anterior approach. Eleven years ago in June I have my left hip replaced. I researched the methods available with an eye to invasiveness and muscle damage. I watched several YOU TUBE videos of actual operations and thought the anterior approach was the way to go. I had the surgery and have struggled ever since with strength in my leg. It appears that the reason is the nerve damage as there was a numb spot on the left leg for many years and the strength has still not totally returned. When my right hip began to cause me pain and weakness I looked for another option. I spoke to many individuals whom I know to have had hip replacement surgery and your name came up consistently. I researched you via internet and all that I read gave me confidence that you were the doctor to do my surgery. With my left leg I was able to start practicing my golf swing after about 9 or 10 weeks. With my right leg I started hitting full shots at 4 to 5 weeks with little to no pain. The entire experience has been much less painful and the recovery has been far faster and more satisfying. One year after having you replace my right hip I have full motion in both hips but still lack strength and experience some pain in the 11 year old hip. All in all, I am much happier with your work than I am with the results for my left leg (the anterior surgery limb).